Am I too late on this unicorn food trend? I've been a bit out of the loop. Please forgive me. I brought treats. I promise these are even pretty easy to make, all things considered. 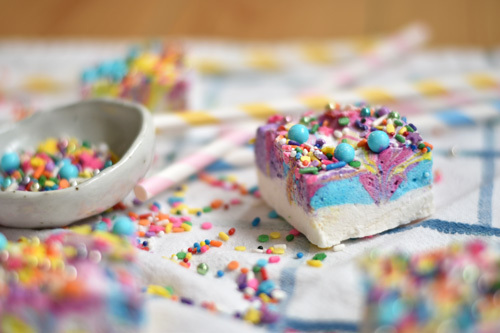 You just need a Lisa Frank fever dream, some sprinkles, food dye, so much sugar, and the ability and motivation to move fast when it's time to assemble and swirl. Next stop: turning these bad boys into s'mores! Begin by coating a 9x9 inch baking pan with a generous coating of butter or oil. Set aside, but nearby. Sprinkle the gelatin and half the water into the stand mixer with the whisk attachment ready to go. Give it a quick mix with a fork and leave it to soak. In a small pot, combine the sugar, syrup, and sugar and remaining water. Stirring occasionally, bring it to a roaring boil for a minute, then remove from heat and allow to cool for 5-10 minutes. When everything is cooled and ready to go, gradually add the sugar mixture to the gelatine mixture, whisking on low until combined. Gradually bring up the speed to medium-high and whisk for 8-10 minutes. The mixture will grow, grow, grow until it has almost triple in size. This is the part where you need to work FAST. Once the marshmallows are nearing the end of their spin cycle (they'll be at almost full volume and firming up a bit) scoop 1 to 1 1/2 cups of marshmallow into each bowl. Continue to whip the remaining marshmallow with the vanilla while you prepare the colours. 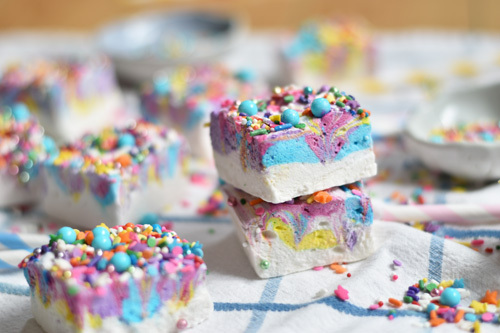 With the marshmallow scooped into the bowls, quickly mix each colour fairly evenly and scoop the dyed marshmallow into the bags, spinning the ends to try to take out any extra air that will dry it up faster. Try to do this in about a minute or less. Trust me. Scoop the vanilla marshmallow mix into the prepared pan and even out the top. Quickly grab one of the colour bags, snip off the end, and pipe the coloured marshmallow in a stripe across the top, repeating with each colour. Take a wet knife and swirl the colours together before it has a chance to firm up too much. Coat with the sprinkles and set aside for at least several hours to set. You want this step done in under two minutes -- not as scary as it sounds once you're going. 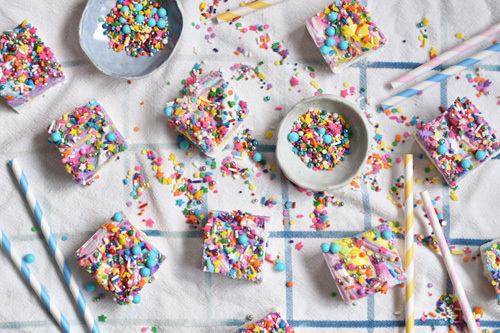 When the marshmallows are set, turn them out onto a cutting board with a light sprinkling of icing sugar and coat the sides to reduce the stickies. You can also do this to each piece you slice to really ensure they don't get too messy.